Chicken is a staple in many diets -- the average American eats 90 pounds annually, according to the University of South Florida -- and chicken legs' juicy dark meat works well in a variety of dishes. Chicken legs make healthy additions to your diet, too, providing minerals and vitamins your cells require to function. Just make sure to remove the skin and fat from chicken legs before cooking to minimize your saturated fat intake. 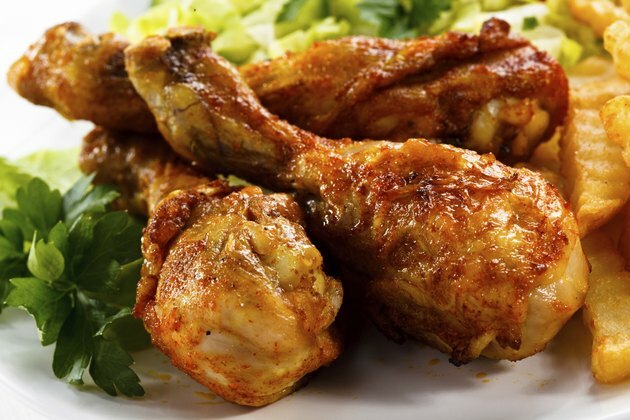 Chicken legs contain a moderate number of calories -- each drumstick, with the skin removed, provides 106 calories, while a skinless chicken thigh contains 176 calories. Both cuts of chicken leg provide ample amounts of protein, a nutrient important for tissue repair and muscle growth. Each drumstick offers 17 grams of protein, and each thigh contains 28 grams. This contributes a significant amount toward your daily protein intake requirements of 46 grams for women and 56 grams for men. Chicken legs also contain some fat -- 3.7 grams per drumstick and 6.2 grams per thigh. This fat provides energy to fuel your lifestyle and aids in vitamin absorption. Incorporating chicken legs boosts your mineral intake, providing significant amounts of selenium and phosphorus. Selenium makes up a component of several enzymes in your cells, and its role in enzyme activity supports the function of your thyroid gland and protects your blood vessels from damage. Phosphorus also helps control enzyme activity, and it makes up a component of your cell membranes and DNA. Eating a chicken thigh increases your selenium intake by 30.9 micrograms -- 56 percent of your daily selenium needs -- and your phosphorus intake by 265 milligrams, or 39 percent of the recommended daily intake. Each chicken drumstick contains 18.5 micrograms of selenium and 158 milligrams of phosphorus -- 34 percent and 23 percent of your recommended daily selenium and phosphorus intakes, respectively. Chicken legs also offer some benefits because of their vitamin content. They supply ample amounts of vitamin B-12 -- a vitamin important for nerve cell health and regulation over gene activity -- as well as pantothenic acid, a nutrient that promotes healthy cell metabolism. Each chicken thigh provides 0.84 microgram of vitamin B-12, which is 35 percent of your daily B-12 needs, and 1.7 milligrams of pantothenic acid, or 34 percent of the recommended daily intake. Chicken drumsticks provide slightly less B-12 and pantothenic acid -- 0.5 microgram of vitamin B-12 and 1.03 milligrams of pantothenic acid. This contributes 21 percent of both your daily recommended B-12 and pantothenic acid intakes. For the leanest meal, remove the skin from your chicken legs and trim away any visible fat before cooking. Avoid preparation methods -- such as frying -- that require you to add large amounts of oil during cooking. Instead, make flavorful roasted chicken legs -- season the chicken with fresh rosemary and thyme before cooking, and add a dash of ground black pepper before serving. Alternatively, sear chicken thighs in a small amount of olive oil to seal in moisture, and then add chicken stock, along with chopped potatoes, carrots and parsnips, for a healthful chicken stew.